Ethical issues over the MLM business structure have been a long time coming. I wrote quite a bit about my early experiences in natural health with MLM pyramid schemes like Shaklee, Mannatech and Melaleuca. I consider MLM engagement to be a season or process in most American’s health journey, at least in the beginning. Sadly, 20 years later, the MLM ethics issue has gotten worse with the help of internet and social media, MLM brand reps use misinformation and incredulous claims to bait their victims, while attempting to lock them in for life. To give you an idea the seriousness of this problem-as a doctor of natural health I am familiar with the laws, for me, I cannot diagnose, nor prescribe and I also can’t make claims that cannot be substantiated. I am fine with this, because I am trained to teach balance and wellness and I realize that healing forces can be initiated by me or through me but true healing always comes from the person who is imbalanced and sick. You may recall in 2015 best selling author and entrepreneur Kevin Trudeau was imprisoned for his cures and weight loss book. He called weight loss “easy” and he used the word cure many times. While I believe he was unfairly targeted, I also knew he was never a medical doctor, a naturopath or even in a health related field. While his intentions may have been noble, he should have known the FDA restrictions and laws. In truth, we know for some people weight loss is not easy and lies deep in the psyche and is blocked and protected-implying that by doing a few physical changes weight loss is easy is really taking away the complexity and importance of body and mind health. Below, are some paragraphs from another blog on organ decongestion and detailed information and proof at how dangerous and misleading MLMs can be! You may have been tricked into thinking that you were detoxing and losing weight by a very deceptive and uneducated MLM brand specialist. You know that call you get from a friend that now turned into a health expert, let me make this clear-don’t mistake a product brand sales rep, with a health professional. This means your loyalty of your friendship should not be dependent upon you buying into their new business adventure- if anything do your research first. When you are approached by an MLM rep misrepresenting themselves as a “health coach” or expert-you can feel either uneasy or bullied. Use these simple rules when being pressured by your MLM buddies. If your product is so “good” why isn’t it recognized or certified by the OCA? Most people-if not all will reply- What’s the OCA? The OCA is the organic consumers association and anyone who cares anything about health and food should become a member. They are a watch dog organization that exposes fake “healthy” products that make irreverent and unethical claims about their products. They also have lists of true organic companies on their site. The OCA does what the FDA and USDA should be doing and doesn’t. Most MLM companies will throw out terms like “Non-GMO, natural and gluten-free” to hook you- don’t be fooled! Remember, there is no real truth in labeling and companies can get away with calling themselves organic often if there is only one organic ingredient in their product! Please See the list of Products: more will be added and updated. Shakeology, Herbalife: Shake company with incompatible protein and simple carbohydrate distribution and low quality vitamins and minerals, NOT organic. Herbalife recently got in trouble for it’s deceptive sales ploys. Arbonne Detox: Arbonne started out as a mediocre make-up company that has now gotten into the lucrative business of selling supplements and detox products. Contrary, to what they promote themselves to be-a health company that cares about your health besides raking in thousands of dollars of your monthly contributions- they are actually a company that sells low-quality products for high quality prices with empty health promises. The back of the Arbonne Shake Bag: Inferior quality cheap vitamins and minerals that cannot be properly metabolized- examples: Vit. B-12 cyanocobalamin, breaks down into cyanide, should be methylcobalamin, Magnesium oxide should be citrate. potassium Iodine, should be Iosol and stevia is banned in Europe. Arbonne 7 day “cleanse” used as a detox- cleanse for sure because these illogically placed hodge podge of ingredients amounts to nothing more than LAXATIVES. Cascara Sagrada and Senna- are dead give aways. The milk thistle might possibly do something, but certainly not in only 7 days and not without utilizing other important protocols such as incorporating anupans or specific herbs, spices and nutritional components for constitution and assimilation. Furthermore, this cleanse is ignoring latent candida/colon congestion, chronic issues like SIBO, kidney congestion and distress-all which could become worse with this dangerous combo. The suggestion to use once a month every seven day will for sure cause laxative dependency and a severe vata imbalance within a short time. Next three exhibits are regarding the essential companies, Do-Terra and Young Living. Both are good, therapeutic grade EO companies. They both have discredited themselves by their renegade brand reps-that encourage people to carelessly ingest oils, use them indiscriminately and insult people who don’t agree with their EO religion. I don’t often agree with the FDA, but it has been rightfully coming down on these companies for their unethical sales practices and contaminated oils (lead). I must warn you this language is offensive. This email was sent to me from the very “loving stable” birth and woman advocate Kara Maria Ananda. She sent me this angry, mean, rant-insulting me for asking her a question about her company. I was met with swearing and utter hatred. This happens often with MLM interactions. 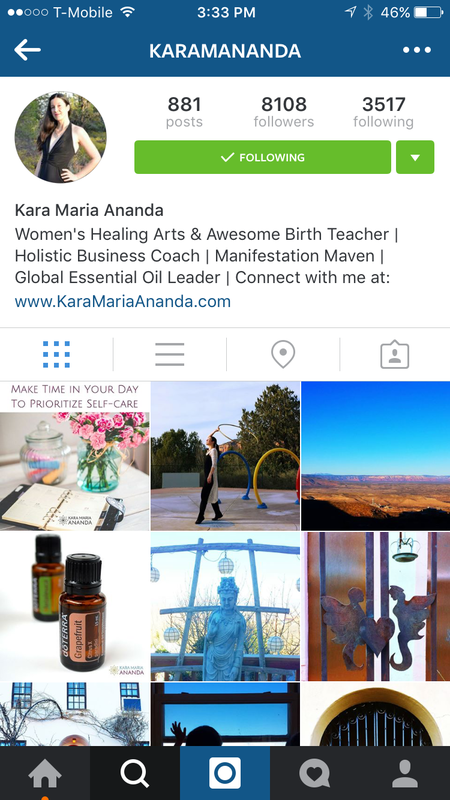 Here is the woman’s Profile on Instagram: Hard to believe this is the same person that sent me an unwarranted, violent and insulting email about her beloved company Do-Terra- She is a self described “Global Leader” in Essential Oil. Sadly, I like Do-Terra but some of their representatives are hurting their company more than helping. Pulled from a breast implant page on Facebook, one of the MLM distributors for EO oils, posted this- Tells you to add this hazardous cocktail of EOs without any mention of how much to mix or what type of oil to mix with. If you applied this mix full strength would likely burn your skin and make you sick. My book “Beyond Natural Skincare and Weight Loss” describes proper usage of Essential Oils and how they can be dangerous. Skin care companies are the worst! This is why I made my own line for years. No truth in labeling and price tags per ounce can exceed $150 or more- for little more than poison and chemicals with a “hint” of something organic to appease the ignorant masses. No company is more harmful in my opinion than the MLM Rodan and Fields-the reps are pushy and blocked like other MLMs but they really don’t understand that the skin is an organ and absorbs whatever you put on it. If you can get a rep to understand that basic fact- you can also get them to understand that their product is filled with “gluten-free, natural” chemicals and poisons and like Arbonne, Nerium and NuSkin- are NOT certified or recognized by the coveted OCA. Here is an example of deception at its finest- little $10 at most roller and skin serum called AMP MD (you cannot even find a list of the ingredients on the website and web) for $230, ! As I said in my book on skincare- a goose neck lamp, a red light, raw milk and eggs- will do more for keeping your skin young than these ridiculous and offensive sales ploys. There seems to be a new MLM pyramid product popping up every few months! Get rich quick schemes are famous in the health, fitness and weight loss. One thing that is not new, is their consistent inability to match the quality of the product with the price-by a long shot. Another note on Thrive Fitness, since this initial interaction with a region rep, I have been able to check out the ingredients myself. I’m not going to waste my time retyping because the ingredients mimicked Arbonne’s ingredients. Fake vitamins and minerals, caffeine and soy-not organic. To be honest, with the price of many of the products, you could easily save money or spend the same at Whole Food’s and get a much higher quality product. I hope these examples help you make better and more qualified decisions in your health and while an MLM maybe convenient way to make sure you get products every month and help you help your friend, more times than not they are hypnotic ploys to throw your money out the window to the top 10% -whether you become a millionaire or not from the MLM, can you really sleep at night knowing that you are purposefully misleading people by presenting a sub-standard product for an unethical, excessive price? Be empowered! You can be a friend to your friend by telling them the truth about these companies, that are no different from the pharmaceutical companies that use deceptive sales tactics to make us buy and want. If you would like to know more about your MLM and whether they are truly healthy, please look them up at the OCA website. If you would like to know more about detoxing and proper organ decongesting and nutrient metabolization click here. Please, contact Dr. Aurore for an in office or on-line body/mind assessment, aurore-vedic detox and health profile. As always you first consult is free.